Sometimes the best ideas involve taking two great things and combining them to form something even better. When it comes to leisure, it doesn’t get much more relaxing than lying in a hammock or taking a dip in a hot tub. The Hydro Hammock blends both forms of relaxing enjoyment into something excitingly new. The one-of-a-kind hammock-shaped, portable hot tub allows users to relax anywhere. Made from highly durable and flexible synthetic fabrics, the Hydro Hammock setup is easy and allows for multiple suspended arrangements. Hydro Hammock can even be placed inground at the beach. 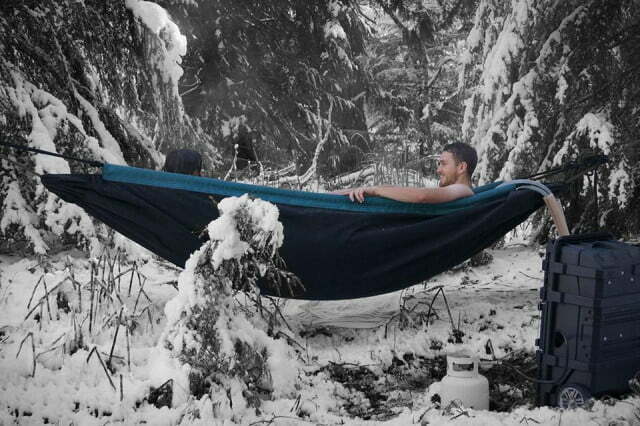 The Hammock holds up to 50 gallons of water and allows for full water temperature regulation thanks to an optional, portable water heating system. This flexibility allows for a refreshing cool water experience, or a rejuvenating hot tub one. Because the fabric is water-tight, no excess water is wasted, making it very efficient and eco-friendly. So whether you’re camping in the spring or fall, lounging at the beach during the summer, or on a ski trip in the winter, the Hammock provides relaxing benefits all year round! The Hyrdo Hammock comes in two great offerings. The single layer Hammock is lightweight and compact. If purchased, it fits inside the heater system travel case. The double layer Hammock offers users an additional insulation layer. This keeps the water at the preferred temperature for even longer. Both options are great for active folks because they allow for full body stretching that is often hindered by traditional hot tubs. Athletes, runners, cyclists and swimmers will love how portable the Hammock is. It travels with them! So whether you love to relax, rehab or both, the Hydro Hammock is perfect for you. The future of relaxation is here.